John James Howe was ordained a Columban Father in December 1936 at Dalgan Park in Galway, and went to Burma, currently known as Myanmar, in 1941 for his mission assignment. In July 1961 he was consecrated a bishop in Bhamo, Burma, one of a handful of Columbans who became bishops. He became the Bishop of Myitkyina, Burma, in the northern region of the country, in the region of the Kachin ethnic minority. Throughout his career, Bishop Howe worked to grow and develop the Catholic community in Burma, especially among the Kachins. In 1962, the Burmese military took over the country under the leadership of General Ne Win, and in 1974 the country officially became a one-party dictatorship. The regime was extremely suspicious of foreigners and any outside influence. The Burmese government began to intimidate and try to expel foreign missionaries, including by passing a law that any missionary who left Burma would not be able to return. Bishop Howe realized that soon the Columban presence in Burma would end. 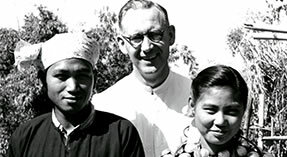 One of the many Burmese clergy that Bishop Howe has mentored was Father Paul Zinghtung Grawng, an ethnic Kachin who was ordained priest in March 1965. Bishop Howe sponsored the consecration of Father Grawng as Bishop of Myitkyina. He handed over control of the Diocese of Myitkyina in early 1977 and then left his beloved Burma later that year. Bishop Grawng later became Archbishop of Mandalay, Burma in 2003 and retired in 2014. Bishop Howe’s selfless act was a superb example of the Columban tradition of developing indigenous clergy in the mission countries.